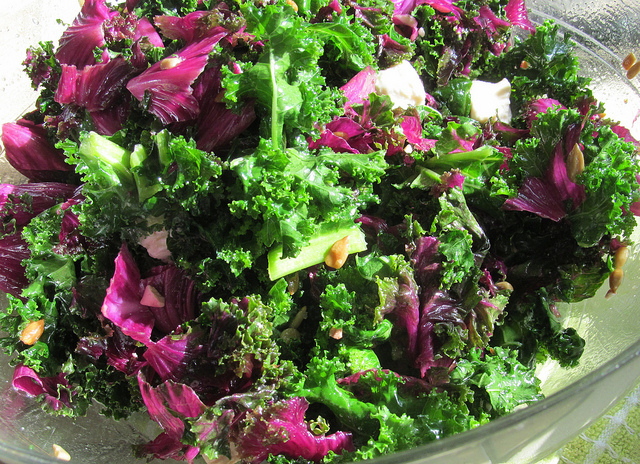 Delicious seasonal kale recipe with added fall toppings for sweetness and crunch! Let’s celebrate National Kale Day! Kale is one of the anti-cancer superfoods rich in cancer-fighting sulphoraphanes, vitamins, minerals, and plenty of fiber. Among the most nutrient dense foods on the planet, Kale is low in calorie content but loaded with powerful antioxidants like quercetin and kaempferol. In this recipe, toasted pumpkin seeds add crunch and even more health benefits including bolstering immunity! L-tryptophan in pumpkin seeds can also improve your mood naturally and help encourage a good night’s sleep. 1. In a large, flameproof casserole over medium heat, heat the oil. Add the pumpkin seeds and cook, stirring constantly, for 2 minutes, or until they are golden. Use a slotted spoon to remove them from the pan; set aside. 2. Add the scallions, apple, and cranberries to the pan. Cook, stirring, for 1 minute. 3. Add the kale, salt, pepper, and water. Cook for 4 to 6 minutes, turning often with tongs, or until tender. Add more water,1 tablespoon at a time, if the pan is dry. 4. Stir in the lemon juice. Taste for seasoning, and add more salt and pepper, if you like. Sprinkle with pumpkin seeds. For best results, serve and enjoy promptly!